For the bacon lovers out there that can’t get enough of the other white meat, there’s bacon bits, bacon jam, and even bacon ice cream – Even Homer Simpson thought it was a magical animal. This technique is called Fat Washing, where a fat (infused with delicious flavour) is mixed with alcohol and then allowed to set, and be removed, leaving an alcohol that is now infused with flavours from the fat. I opted for Gentleman Jack, which in a nutshell is Jack Daniels that’s been twice charcoal mellowed instead of once, and makes it smoother around the edges. That, and it would be blasphemy using a better whisky without first fine-tuning this. Stir it to get a good mix and leave it in the fridge over night. 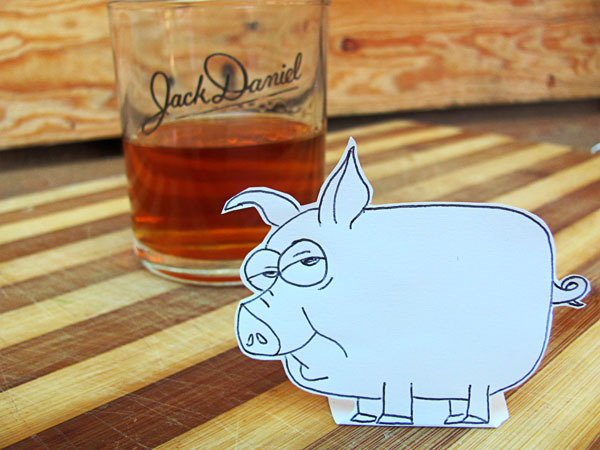 How this works: when fat is put into bourbon it absorbs a lot of the harshness (brilliant), and then the alcohol dissolves a lot of the aromatic compounds that make bacon so awesome (twice brilliant!). As much as bacon is delicious, finding a fat globule in your evening drink isn’t, so make sure you strain all the fat out. Let me know what you thought if you’ve made this, or what you would like to try Fat Wash, in the comments. You can also read how to make Jack into fake caviar here.